Providence - Rhode Island authorities acted properly when they shut down the Narragansett Indian tribe's tax-free smoke shop, a federal judge ruled in December. U.S. District Judge William Smith said the state had the right to tax cigarettes sold at the shop on the tribe's settlement land in Charlestown. Seven members of the tribe, including the tribal leader, were arrested by state police in a tumultuous raid on the shop in July. The tribe filed suit after the raid arguing that, as a sovereign nation, it has a right to sell tobacco free of state taxes. The state argued that the tribe is bound by terms of a 1978 settlement agreement that gave the tribe 1,800 acres of land. Smith ruled that the state's tax falls on the tobacco consumer, not the tribe, making the tribe simply an agent for collecting the tax. "It is appropriate for the state to impose this burden on the tribe; and such a burden does not amount to taxation of the tribe, nor does it violate the tribe's sovereign rights," Smith wrote. The state charges a $1.71-per-pack excise tax on cigarettes plus a seven percent sales tax. Synergy Brands Rolls Out New Website for Cigars Around the World Division; Partners with Yahoo! 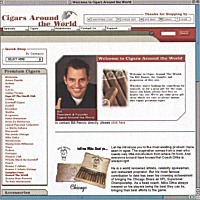 Syosset, N.Y. - Synergy Brands, Inc. has launched a new cigar website at www.cigarsaroundtheworld.com, which is hosted on Yahoo! in order to reach an "alternative audience" as well as "increase potential exposure for its cigar retailing operation." Order fulfillment will be handled out of the company's distribution center in Florida. The new site provides the company with additional and alternative Internet sales opportunities that features a cigar "gift of the month" program as well as a unique variety of proprietary premium cigar selection, according to Stephen Barbella, c.e.o. of Synergy's cigar division. William Rancic is president and founder of the Cigars around the World operation, which was acquired by Synergy's cigar division in early 2003. Rancic has been appearing on the NBC reality show, "The Apprentice," hosted by Donald Trump. The show features a group of 16 contestants who carry out a variety of tasks assigned by Donald Trump. The goal is to see how much money each "team" can make each week. The team that succeeds receives a special perk from Trump while the losing team faces the "firing" of one of its members by Trump. A live finale of the show is scheduled for April when a winner will be chosen and will receive a one-year job from Donald Trump. Rancic, of Chicago, was among more than 250,000 individuals who vied to be part of the final group. He founded Cigars Around the World eight years ago Cigars. New York - Davidoff's newest and most innovative flagship store opened its doors at the $1.7 billion Time Warner Center on February 5th. Davidoff continues to change the face of premium tobacco and luxury goods retailing with this newest shop. 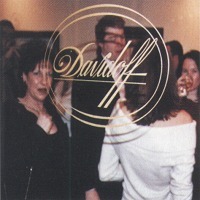 Bringing customers a truly exceptional and unique opportunity to enjoy "The Good Life," Davidoff at Columbus Circle is both a resource and destination for connoisseurs worldwide. In addition to the finest in premium cigars and smokers accessories, Davidoff at Columbus Circle is working with artisans from around the world to create an unique, rotating collection of hand-crafted, one-of-a-kind accessories. Paul Del Rossi, co-owner of the store with his wife, Suzanne, says, "Our merchandising philosophy is to present products that embody three characteristics: they are based in history, culture and art; they are unique, limited, one-of-a-kind; and they embody "The Good Life" - no matter how one defines that for him or herself." Suzanne adds, "We believe that the demographic audience for this store is as broad-based as any store in New York. We'll have products that excite young and old, women and men, smokers and non-smokers." Designed by Carlton, Finneral, Mahoney Design of New York City and Boston, Davidoff at Columbus Circle features a unique circular humidor at the center of the shop; ceiling art created by Ken Maryanski; a hardwood floor that radiates from the center of the humidor to evoke the sun that nurtures tobacco leaf growth; and a separately-ventilated (New York statute-approved) private smoking room, with commissioned art by American artist Jim Burke and Dominican Republic artist Juan Rodriguez. The smoking room will provide a comfortably appointed haven to special customers, with the option to purchase individual, private humidors for cigar storage. Davidoff chairman Dr. Ernst Schneider, c.e.o. Dr. Reto Cina, and the Del Rossi family explained that the evolution of the Davidoff brand through new product categories will contribute to the growth of the brand in the United States. An aggressive series of store events including tastings, seminars, and other special attractions has accompanied the store opening. Peter J. Katz, formerly of Alfred Dunhill on Madison Avenue, is the store's senior vice president and general manager. Graham Howarth serves as assistant store manager. Olympia - Washington smokers who avoid taxes by buying cigarettes online might face exposure now that a Kentucky tobacco seller has agreed to name names to Washington state officials. DirtCheapCig.com Inc. entered into a stipulated judgment in U.S. District Court in Seattle in December and agreed to provide the state with names and addresses of all Washington customers who have bought tobacco products since Jan. 1, 2001, the state Department of Revenue said. The company also will begin filing monthly reports. Ft. Lauderdale - Altadis U.S.A. has announced the winners of its Trinidad Window Display Contest in which authorized Trinidad retailers were invited to create displays featuring Trinidad cigars and submit photographs of their designs for judging. 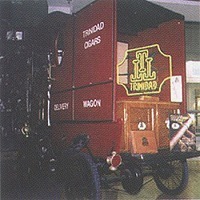 The grand prize went to Ol' Times Tobacco Shop of Sanford, Fla. whose winning display featured a 1920's style cigar delivery wagon. The runners up were G&G Cigar company, West Chester, Penn., and Tobacco Shop of Ridgewood, N.J.
Ol' Times Tobacco Shop will receive first class airfare for two to La Romana, Dominican Republic,; lodging for four nights at the Casa de Camp resort; golf at the world famous "Teeth of the Dog" golf course; and a private tour of Tabacalera de garcia, the world's largest premium cigar factory, where Trinidad cigars are made. Each of the runners up will also receive a framed canvas serigraphs from French artists Michel Delacroix of the new "La Campagne Cubaine."